After growing up mostly in India but including several years in Washington D.C., Professor Nirvikar Singh was struck by the degree of inequality he observed across the two places. He wanted to understand why India was so poor. In many ways, his firsthand encounter with the stark contrasts in wealth, poverty, and standard of living between India and the United States is what motivated him to pursue economics. His research interests in economics are broad, ranging from investigating the effects of technology, innovation and the digital revolution on economic change, to uncovering the motivations of Indian‐American entrepreneurs, to analyzing incentives for governance, to, more recently, finance and risk with the Sury Initiative for Global Finance and International Risk Management (SIGFIRM). 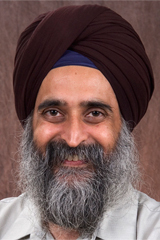 As holder of the Sarbjit Singh Aurora Chair in Sikh and Punjabi Studies, he is also working on a project focusing on the experience of Sikh entrepreneurs in the United States and, in particular, on the role of religious identity in shaping their business practices. Professor Singh has taught a number of courses including the Economics of Electronic Commerce, Corporate Finance, and the Economics and Management of Technology and Innovation, all of which he says are informed a great deal by his research in e-°©‐commerce, information technology, and microeconomic theory. He expresses disagreement with the idea that teaching and research are disconnected and one is always at the cost of the other. He argues that the two are intimately linked and says the structure of his classroom is heavily dictated by his research findings. Professors “need to know the field, not just the textbook” in order to provide deeper insight, and this specialized knowledge is at the heart of the model of education in the UC system. Motivated by his work with SIGFIRM, he discusses what he feels are three of the most important questions facing economists today. The first involves gaining a better understanding of market design. With the fall of the Berlin Wall in 1989, some argued that this was clear evidence that markets work and central planning does not. However, the reality would seem to indicate that markets work frequently, but not all the time. He gives the example that you can’t have a daily market like eBay for students to bid on professors’ lectures, and even the stock market is governed by elaborate rules. In order to prevent the recurrence of financial crises like 2008, the solution is not to ban markets for esoteric financial products, but rather to design them better so that they are more transparent and less easily manipulated. The second issue concerns financial access, which is integral to gaining a better understanding of the contrast in economic development between different countries. Finally, Professor Singh’s third question involves addressing systemic risk, which was also central to the recent economic crisis. Individual markets can be designed to work well, but there may be externalities which are magnified in the aggregate, resulting in systemic risk. How can society deal with such systemic risks to avoid extreme instability? To students, Professor Singh echoes what he feels is common advice: “find what you love and specialize”, but to keep in mind the T‐model of expertise, which encapsulates the idea of having depth of knowledge in one area, but also accompanying breadth . He emphasizes the importance of mastering the tools of modern technology and gaining the ability to manipulate words, numbers, and graphics to communicate with these tools. He also suggests that it wouldn’t hurt to pick up some language skills -- spoken or even computer programming languages. In an increasingly globalized society, being multilingual and multicultural is crucial to success.